Using Dentsply-Bioblend®? Switch to Justi Blend today and save money without sacrificing quality! Get a No-Strings Attached Tooth Consignment Today! 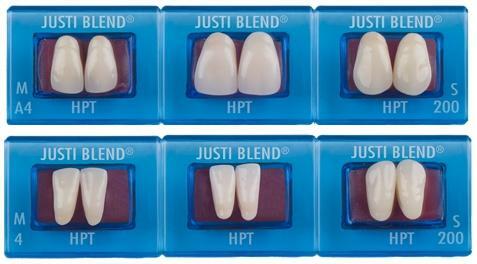 Justi Blend brings a fresh and natural look to multi-blended characterized plastic anterior teeth. It is the right choice for today’s cosmetic industry. Justi Blend is a highly cross-linked, fluorescent, vacuum processed, laminated plastic tooth. It is unique in that the structure of this tooth line creates the vitality of a natural tooth. The centrals, laterals and cuspids each have a different tone and this combination of tones blend together in one set. The semi-translucent body helps create a depth within the tooth and reflects color from within, just as dentine does in a natural tooth. Justi Blend posteriors are designed to articulate with Justi Blend anteriors as well as Dentsply’s Bioblend and Bioblend IPN anteriors. The line is available in 18 upper and lower molds in 0 degree, 10 degree, 20 degree and 33 degree anatomical medium and long. Anteriors and posteriors are available in nine shades: 200, 202, 204, 206, 208, 210, 212, 214 and 216. There are two different shade guides available for this tooth line. The Justi Blend Maxillary Centrals Shade Guide displays nine blended shades in centrals only. It is affordably packaged in an optically neutral light blue frame with an Eterna shield and a Kroma tab which allows the specialist to view the teeth on a neutral background. This shade guide can be customized with the name of a laboratory or clinic, plus a marketing message. It is all held in a soft side wallet which has a shade comparison chart included for quick conversions. The Justi Blend Shade Guide – Extended Blend Selector is attractively presented in a hard black case that holds the nine blended shades of this beautiful tooth line. Each shade of the guide has a central, a lateral and a cuspid which are in the same hue but in different “tones”, thereby creating a natural blended effect. This extended blend selector is made to be used for anteriors and posteriors. Justi Blend anteriors match the central, lateral and cuspid, right and left respectively. Justi Blend posteriors match the right or left cuspid body in tone and hue. All nine Justi Blend shades are presented from light to dark shades. A Kroma tab is included, as well as an Artificial Mold Selector, a Technicians’ Ruler and a Shade Comparison chart. For more information about the Artificial Mold Selector and the Technicians’ Ruler, please see the Justi Educational Materials in the catalog. It is recommended that the shade guides be disinfected by soaking in an acid or alkaline glutaraldehyde solution. 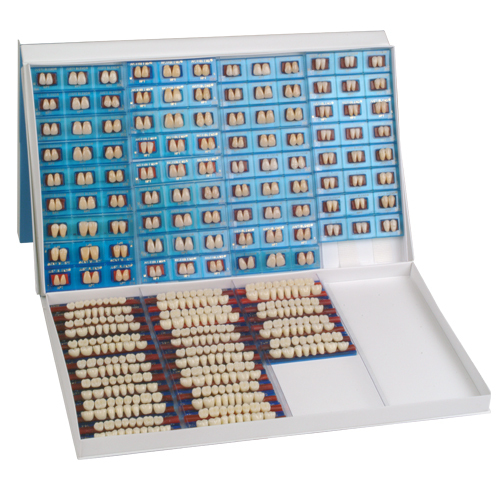 Justi Blend teeth are made according to ADA Specification #15 for artificial resin teeth. 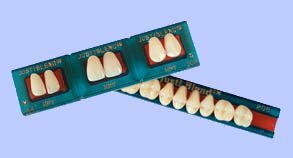 The teeth are photogenic, vacuum-processed and are 100% guaranteed to be bondable to methyl-methacrylate denture base materials. All Justi tooth lines can be professionally cleaned using Renew Denture Cleaner.